Hollystown is a sought after rural living environment just 12 Kms from the City. The renowned (27 Hole) Hollystown Golf Club is the focal point of the area. The Completion of the new N2/N3 Link road has made Hollystown immediately accessable to Blanchardstown, the M50 and Ashbourne. Tyrrelstown Town Centre is situated just 5 minutes drive south of Hollystown. There have been circa 350 houses built in the Hollystown area over the past 15 years predominately detached in design. The property comprises a residential and commercial development site, regular in shape of approx. : 1.73 Hectares/ 4.27 acres. "Duinch" A truly imposing and mature 5 bedroom residence is discreetly tucked away on the lands and is included in the sale. Situated on Hollystown Golf Course with a highly desirable prominent profile and generous main road frontage. This property offers an exclusive opportunity for a mixed residential & Commercial Development. In the 2011 - 2017 Fingal County Development Plan the property is zoned "R.V" Rural Village: - "protect and promote a vibrant community in accordance with an approved local area plan , and the availability of physical and community infrastructure" and "LC" Local Centre "Protect, provide for and or improve local centre facilities". 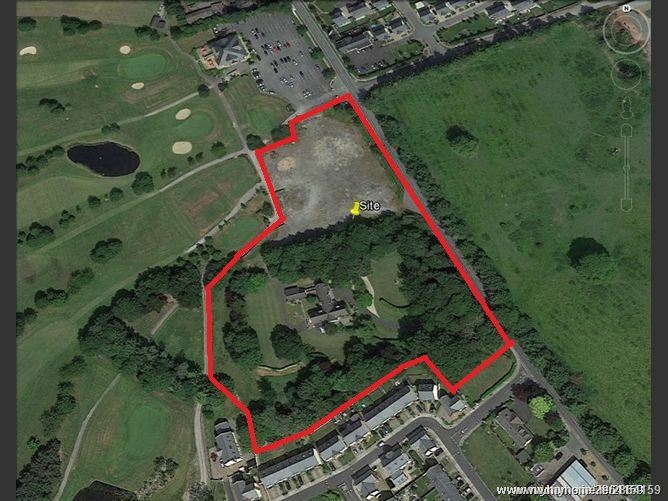 Prime location on Hollystown Golf Course offering an exclusive opportunity for a mixed residential & Commercial development. grounds with water feature to front. • Exposed ceiling beams to kitchen. • Feature open fireplaces to Hall & Living room. • Raised timber decked area off breakfast room. From Hollystown Roundabout take left turn, proceed past the garage on the left hand side, "Duinch" is located on the left hand side.